UK travel hacking – all you need to know! Thank you for visiting Head for Points, the UK’s biggest frequent flyer website. We are focussed on helping you earn more miles and points and spending your existing pile more effectively. Thousands of UK business travellers visit Head for Points every day. They read the latest business travel news, flight and hotel reviews and learn UK ‘travel hacking’ tips to make the most of their miles and points. This page explains more about the site and what you will find here if you choose to become a regular reader. If you are new to air miles and Avios, take a look at our ‘Beginners Guide to Collecting Avios Points‘ which answers a lot of questions you may have. After that, a good place to go is the ‘Favourites‘ tab – in particular, our ‘Avios Redemption University‘ articles. If you want to know the inside secrets of how to get the best value when you spend your Avios points, you need to read these 15 articles. You should also check out our ‘Credit Cards Update‘ page, as signing up for a travel credit card is by far the easiest way to build up your Avios and other points quickly. For example, the FREE American Express Preferred Rewards Gold card will get you 10,000 points just for signing up and spending £3,000. After all that, you need to decide how to follow Head for Points – by bookmarking the site and checking it daily (my preferred choice), signing up to our emails via the box further down this page or following us on Facebook, Twitter or LinkedIn. What is Head for Points? Head for Points is the only widely-read UK business travel site focussed on collecting airmiles and hotel loyalty points. … that you can fly to the United States on Aer Lingus in Economy for as little as 26,000 Avios and £75 tax return? And that whilst you can book these seats online via avios.com, taxes are lower if you book with BA by phone? … that the tax on Iberia redemptions is 60% lower if you transfer your Avios to Iberia Plus and book via their website? … that redemptions on Iberia to certain destinations now require far fewer Avios than British Airways flights to the same place? New York in Business Class can be as low as 68,000 Avios return from Madrid when BA wants 120,000 Avios return from London. … that you can earn Avios when you fly on Emirates as long as you book a Qantas codeshare service? … that you can earn Avios when you fly United Airlines – even though it is a Star Alliance member – by crediting your flights to Aer Lingus AerClub? … that there is more Avios availability on Iberia flights if you move your points to Iberia Plus and book from there? These are the sort of things you will learn every day on Head for Points. What is the site philosophy? We know that business travel can be hard work with long periods away from your home, friends and family. We hope that we can help you make the most of your miles and points. We can help you treat yourself, your friends and your family to amazing experiences, in premium business or first class cabins, to make up for those missed parties, school sports days or anniversaries. My name is Rob. If you read online travel forums such as Flyertalk, where I have posted since 2004, you may recognise my screen name of Raffles. I have redeemed over 10 million air miles and hotel points over the last decade. I currently have over 1.5 million Avios points, 1.5 million Virgin miles and 7 million airline, hotel and credit card points in total. You don’t get to those sort of numbers without learning a few tricks of the trade. In March 2019, Head for Points generated 1,746,000 page views from 376,000 unique visitors. In a good week, alexa.com ranks Head for Points as one of the 800 most visited websites in the UK. Full readership data can be found on the ‘Contact’ page. My colleague Anika focuses on hotel and flight reviews, competitions and general travel news for Head for Points. She is also Editor of Shopper Points, a site focussed on collecting Tesco Clubcard and Nectar points. … although, in reality, I will write about any scheme if it is offering a special promotion that I don’t want you to miss. We also keep you updated with the latest business travel news. 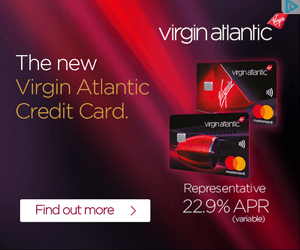 The site also contains the UK’s leading loyalty credit card guide – click on ‘Credit Cards Update’, our comprehensive directory of UK airline and hotel credit cards, in the menu bar. This will show you the best travel credit card deals currently available. If you are a new reader to Head for Points, you can catch up with some of the most useful articles published over the last year by clicking on the ‘Favourites‘ tab. How can I receive Head for Points each day? The best to way to read Head for Points is to bookmark www.headforpoints.com and check back daily to see what is new. New articles are usually uploaded by 6am UK time, seven days a week. If you visit the site in the morning, or receive the daily emails, it is worth popping back to the website later in the day to see the comments left by other readers. These often add valuable extra information (or correct my mistakes). You can also follow us on Facebook, Twitter, LinkedIn, Apple News, Flipboard and Instagram. Over 42,500 people currently subscribe to our email and social media feeds so you will be in good company. We also have a YouTube channel.